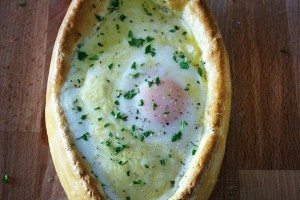 This recipe confuses me. I don’t know whether to call it chocolate banana cake or bread. It plagues me. It’s not a traditional brown loaf like other banana breads, plus it is much lighter in texture and has a nice crunchy layer of streusel on top. But it’s not a cake either. It is not smeared with icing, and there are no layers or sprinkles. I wouldn’t put candles on it and serve it for someone’s birthday. It’s like Mr. Goodbar. Do you taste the chocolate first or the peanuts? I can never tell! I end up having an aneurysm and passing out from the pressure. 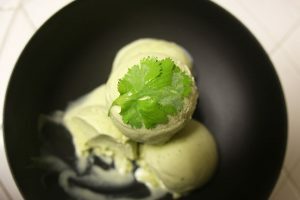 But perhaps this concoction doesn’t have to be one or the other. That is why I’m a big fan of -ish. “-Ish” is that big fat gray area for when you just don’t wanna commit. When would you like to have lunch? Noon-ish. When will you be able to complete the project? Thursday-ish. What is this incredibly indulgent fantastico deliciousness I just tasted? Chocolate Banana Cake-ish Bread. Ohhhhh my! Sometimes a girl just needs an -ish. I’ve done a number of twists on this recipe. 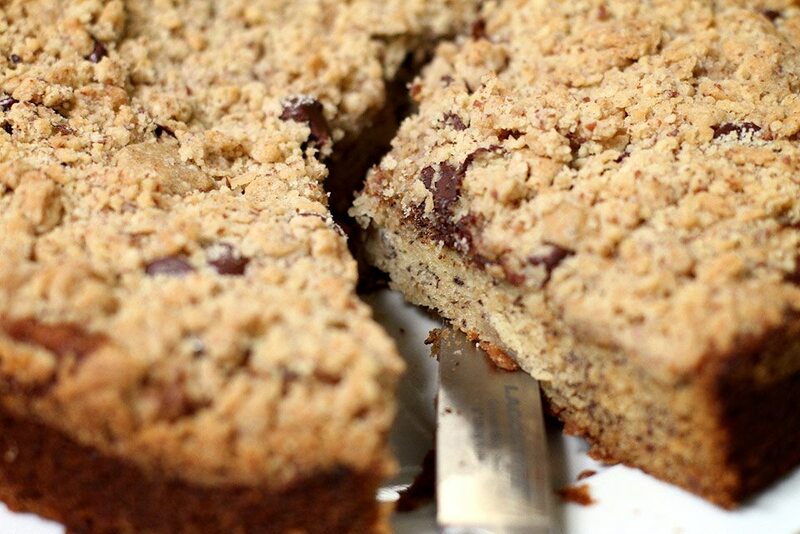 Replacing the streusel with sliced almonds is always a winner and gives the cake-ish bread just a beautiful look. Lately, I’ve been without a mixer so I needed a way to get my fix without having to cream the butter. Take the butter and brown it. Then whisk together the sugar, eggs and brown butter. Continue with the recipe. Want help browning the butter? Check this out. Cream together the sugar and butter until light and fluffy. Add ground almonds, vanilla and flour. 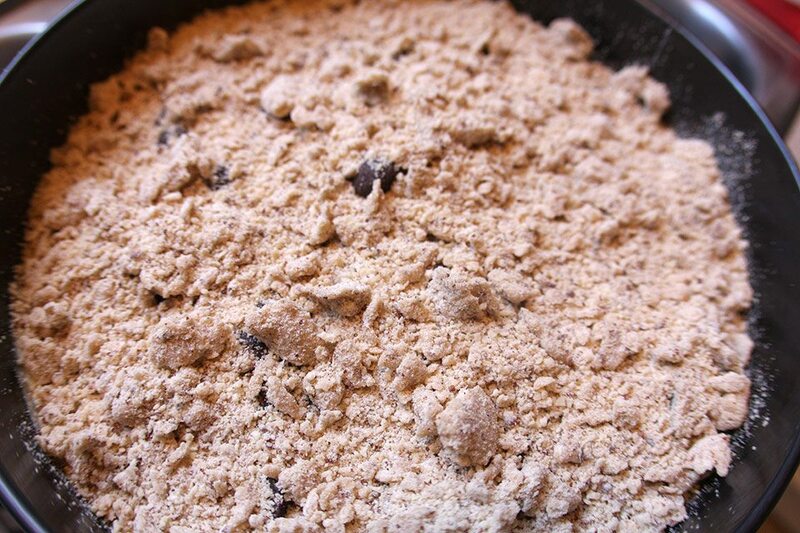 Mix just until combined, and the texture resembles coarse crumbs. Store in freezer while preparing the batter. Preheat oven to 325F (163C). Line the bottom of a 9″ round spring form pan with parchment paper (optional), and grease with butter or nonstick spray (not optional). Beat together the butter and sugar until doubled in volume, light and fluffy. Add eggs one at a time beating until incorporated after each addition. 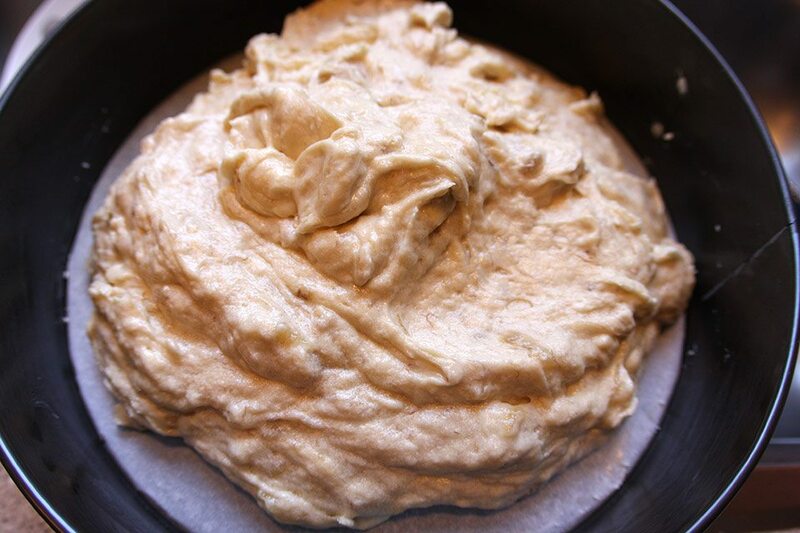 Mix in mashed bananas until evenly distributed. In separate bowl, mix together flour, salt and baking soda. Add dry ingredients to butter and sugar mixture, and mix just until combined. 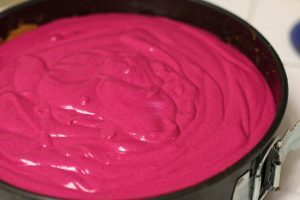 Spread batter evenly in spring form pan. 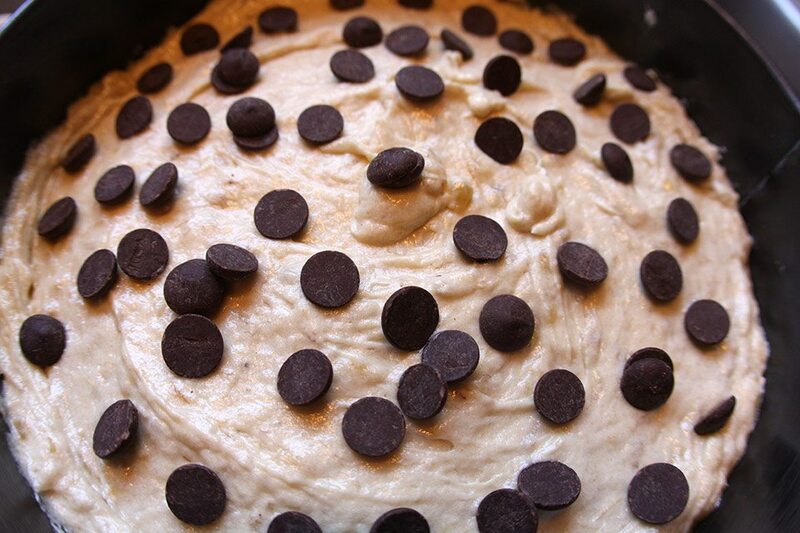 Cover batter with chocolate chips. Top with streusel. Bake banana bread for 40 to 45m, until a toothpick inserted comes out clean. First photo courtesy of Ed Szegvary. Thank you!